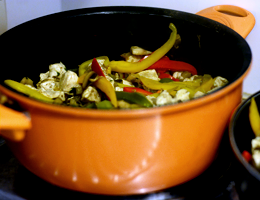 Tortillas loaded with colorful veggies, juicy chicken breast, handmade Guacamole and lots and lots of cheese. Of course, everything spicy and hot. 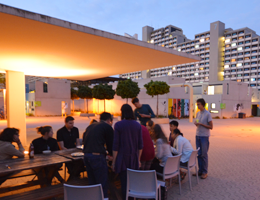 Aaron brings typical Mexican comfort food to Studentenstadt. Indian curry, mango salad from Costa Rica, tiramisu from Italy: International Night at the Graduate School of Systemic Neurosciences sees cooks on campus pulling out all the stops. As their Summer School nears its end, six students from Serbia and Bulgaria are preparing dinner for the rest of the - very international - class. 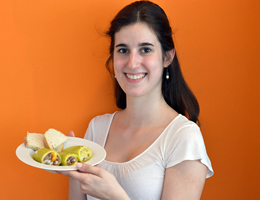 On the menu are some scrumptious Balkan treats: cold cucumber soup, moussaka and Bulgarian pancakes. 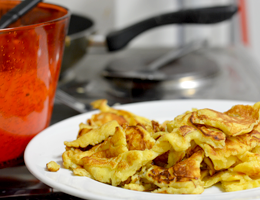 Austrian Kaiserschmarrn is fun to make, and even more fun to eat. It makes one feel good, just as working for one’s fellow-students does, says Carmen – for today’s Cook on Campus is a member of the Students’ Council at LMU. Won-ton soup, beef in oyster sauce, and egg and tomato: Rong’s menu for Cooks on Campus gives you a taste of what Chinese students generally eat – and she tells us what really helped her to survive her first semester at LMU. 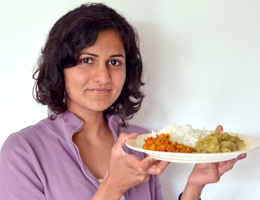 For Naina, our latest “Cook on Campus”, the idea of cooking without condiments is inconceivable. No wonder coriander, mustard and turmeric are essential elements of her Indian aubergine curry. 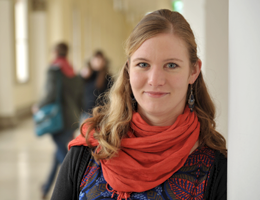 The Christkindl markets in Munich are already in business, Advent has just begun – and Neele, our latest Cook on Campus, is about to introduce the members of her regular German-Indian roundtable to the joys of homemade Christmas cookies. 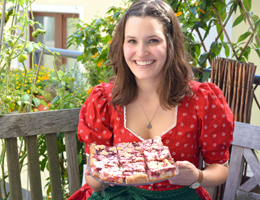 This time Cooks on Campus is wearing Dirndl and Lederhose, and staying at home: Instead of featuring recipes contributed by foreign students at LMU, we have chosen some typically Bavarian treats to go with the world’s largest popular festival – the Oktoberfest on Munich’s Wies’n. Everything is coming along nicely at the barbecue area Am Flaucher. 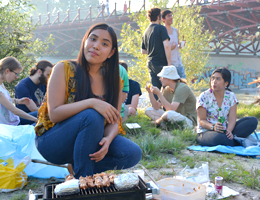 The charcoal is glowing, the marinated meat kebabs are lined up waiting their turn on the griddle, Marielle has put the drinks in the Isar to chill. Only her guests are missing. “I really have no idea who’s coming this evening,” she says. Maša, who is studying Physics, has invited her mentor Philipp over for dinner. ”I think it’s a nice way to thank him for the help he has given me,” she says, when the dish is in the oven, and captivating aromas of meat and garlic begin to pervade the kitchen. A voyage around the world’s kitchens with LMU: International students invite friends to help them prepare - and consume - their favorite dishes from home. And in the course of the evening they talk about their studies, LMU and how they settled in – and, of course, what they enjoy most in Munich when they’re not studying. The tasty recipes from all over are delicious and will appeal to cooks of all levels of skill. 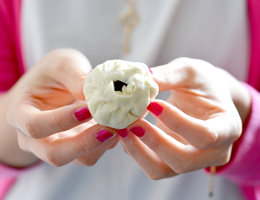 The recipes will be assembled into an online cookery book, and provide unique insights into the culinary background, and other aspects of the cultural heritage of the many foreign students at the University. Bon appetit! 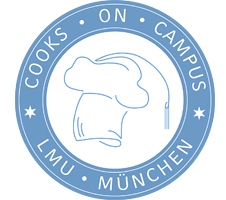 If you are an international student at LMU and you enjoy cooking, you too can be one of our Cooks on Campus. Just drop us a line (presse@lmu.de), and we will reimburse the cost of your menu (up to a maximum of 100 euros).